The salvo launch of sea-based Kalibr missiles from the submarine Rostov-on-Don against ISIS facilities in Syria has proven the effectiveness of this system and the targets have been hit with exclusive precision, Russian Defense Ministry official Major-General Igor Konashenkov told reporters on . 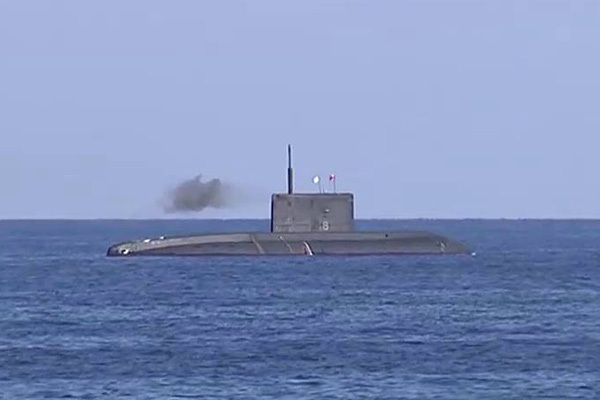 "The first salvo launch from an underwater position of sea-based cruise missiles Kalibr has been conducted from the submarine Rostov-on-Don, which was in the Mediterranean Sea. The special thing about the latest strike is their salvo launch from an underwater position using the torpedo-launching tubes of the submarine," he said. A massive rocket and aviation strike has been delivered on the terrorist infrastructure of ISIL in Syria using high-precision weapons, Konashenkov said. Sea-based cruise missiles Kalibr and guided bombs KAB-500 were used in the strike, the most important terrorist facilities were destroyed. "The available objective control data have again confirmed the high effectiveness of the Kalibr. All targets were hit with the highest precision. I will recall that that range of cruise missiles Kalibr is some 2,000 kilometers," Konashenkov said.